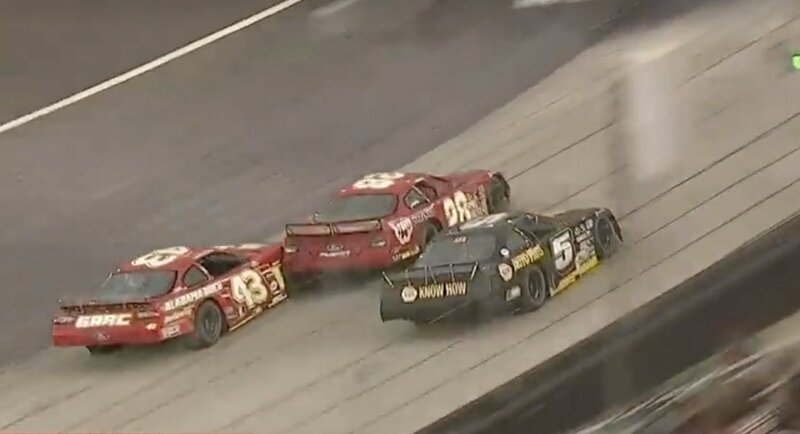 This weekend multiple asphalt short track racing series have rolled into Bristol Motor Speedway for second annual running of the Short Track U.S. Nationals. The Bristol, TN track is known to push the buttons of drivers, crews as well as fans. It didn’t disappoint in that department during the Friday night feature event around the .5-mile concrete oval. The JEGS CRA All-Stars Pro Late Model brought the action to the track then that action carried over to the pit lane. Jack Smith found himself in the middle of a 3 wide situation heading into turn 1. Justin South had a look to the inside. However, Smith still considered it his lane. He proceeded to turn down across the nose of South. The #28 driver found himself sideways in front of the field. He went backwards up the banking and his chance at the win evaporated. The race was called early due to weather. That brought an end to the event and it also brought the cars to the pit lane. Smith walked over and located South. As the driver was still strapped to the race car Smith reached in the window and landed a punch. Smith was then attacked by crew members. With blood dripping from his forehead, Smith was finally pulled out of the scene by CRA officials. By this point, South had climbed from his race car. “Watch the replay!” South responded to Smith. As things calmed down, a crew member told Smith, “You got one coming.” The crew member then gave a final push to South while exiting the pits. “I started dead last! I ain’t got a mark on my car,” South gave his final defense as the angry crew member walked off into the distance. Smith was then escorted from the facility. “I think it’s pretty self explanatory, Pro Late Model driver Jack Smith explained to Speed51.com. “You know, I got dumped there. South finished 5th in the event. Smith finished in 9th. Josh Reeves won the event. He’s a local boy. Reeves moved to the surrounding area in January to chase his dreams. This was just the support class action. The big show takes place tonight at Bristol Motor Speedway in the final night of the US Short Track Nationals in Bristol, TN. Watch the video of the on-track contact as well as a portion of the post-race altercation below. The full results from the Pro Late Model race on Friday night at Bristol Motor Speedway are posted below as well. 11. (5C) Michael Clancy Jr.
21. (12G) Joe Graf Jr.
24. (33) Wes Griffith Jr.